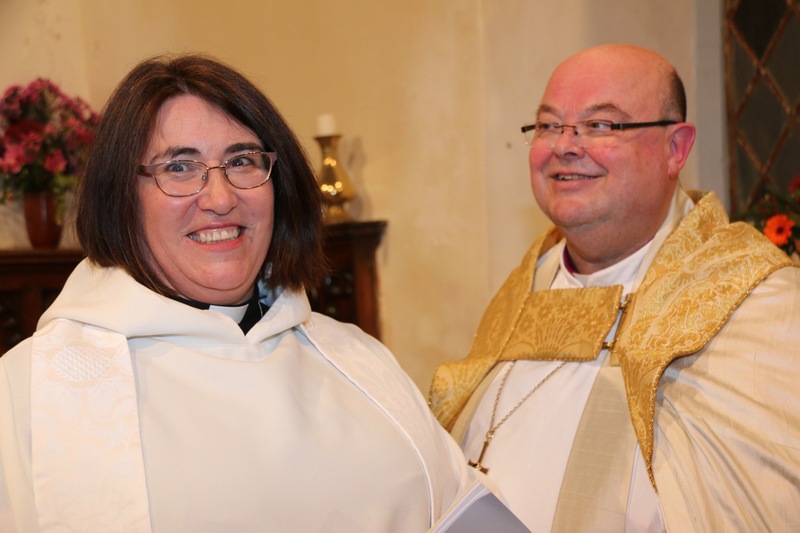 On Friday evening, 5th October, in Saint Colman’s Cathedral, Cloyne, County Cork, the Cloyne Union of Parishes welcomed their new rector – Susan Green. 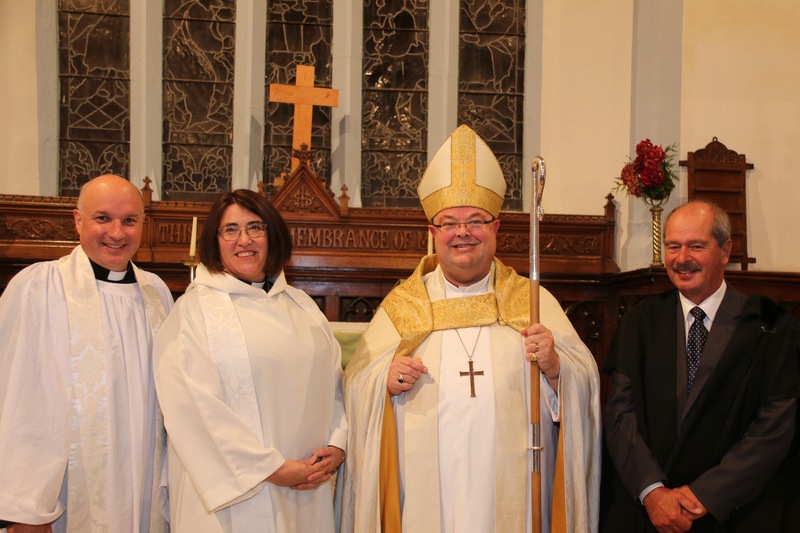 The Bishop, the Right Reverend Dr Paul Colton, who presided at the Service, instituted Susan to the incumbency of the Cloyne Union of Parishes, and appointed her as Dean of Cloyne. The new Dean with the Bishop. At the same Service, therefore, Susan was installed as Dean of Cloyne by the Archdeacon, the Venerable Adrian Wilkinson, on foot of the mandate of the Bishop. Present to support the new Dean were members of her family including her husband, the Venerable Andrew Orr who is Archdeacon of Ossory and Leighlin, and their daughter Rachel, as well as Susan’s mother and other members of the family circle. Bishop Colton said that he hoped that the entire family – Susan, Andrew, Rachel, Patrick and Ciara – would feel welcome in their new surroundings in East Cork. 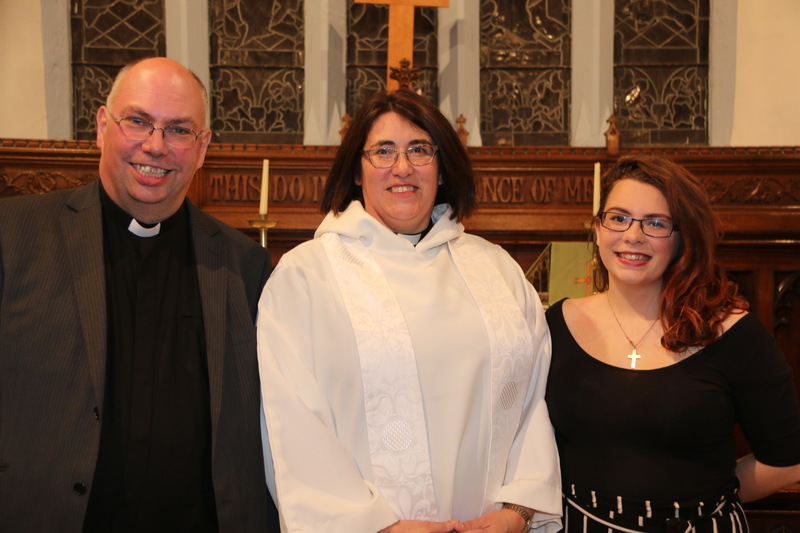 The Very Reverend Susan Green (centre) with her husband, Archdeacon Andrew Orr, and their daughter, Rachel. Among those present were Cllr Michael Hegarty representing the Mayor of County Cork, Minister of State David Stanton, T.D., Kevin O’Keeffe, T.D., and the principals of the two schools in the parish: Dr Edward Gash (Principal of Midleton College) and Ms Elma Huggard (Principal of St John the Baptist National School, Midleton). Children and young people from both schools took part in the Service. Parishioners, clergy and readers from Cork, Cloyne and Ross were joined by the new Dean’s former colleagues in Kilkenny College and from the Diocese of Cashel, Ferns and Ossory. Representatives were in attendance from the community including An Garda Síochána, and Midleton Rugby Club. Ecuemnical guests from sister churches included: the Reverend Richard Cronin (Presbyterian Church in Ireland), Canon Jim Killeen (Parish Priest of Midleton), Father Pat Linehan (Parish Priest of Cloyne) and Father Patrick McCarthy (Saleen). Following the institution and installation were (l-r) Archdeacon Adrian Wilkinson, the new Dean, the Bishop, and Mr John Jermyn, Diocesan Registrar. 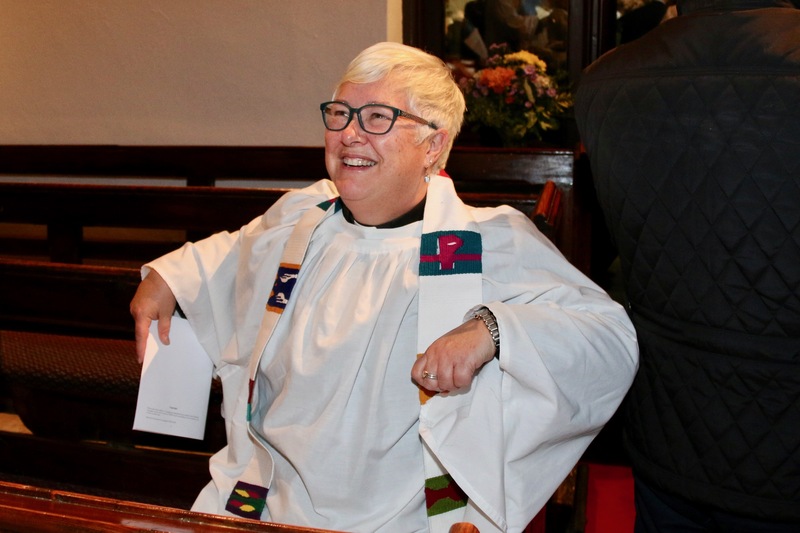 The Very Reverend Susan Green is now the first woman to serve as Dean of a Cathedral in Cork, Cloyne and Ross. Preaching at the Service, the Reverend Katharine Poulton, Rector of Julianstown, who herself served as Dean of Ossory for a time, referred to the fact that Susan is now one of only two women who are Deans of Cathedrals in Ireland, the other being the Very Reverend Maria Jansson, Dean of Waterford, who was also present. Other Deans present were the Dean of Cork, the Very Reverend Nigel Dunne, and the Dean of Lismore, the Very Reverend Paul Draper. The preacher, the Reverend Katharine Poulton, enjoys a light-hearted moment after the Service. The Quire and Nave of the Cathedral were full for the Service at which the Clerks Choral, under the direction of Colin Nicholls, sang, and the organist was Ian Sexton. At the conclusion of the Service, the Bishop thanked the parish for all their hard work and faithfulness. Rowena Walsh welcomed the new Dean on behalf of the parishioners, and the new Dean addressed the parish for the first time. Afterwards everyone was entertained in the nave to supper provided by the parishioners of the Cloyne Union of Parishes. In addition to the Cathedral Church of Saint Colman, Cloyne, the Union of Parishes encompasses Midleton, Corkbeg and East Ferry. 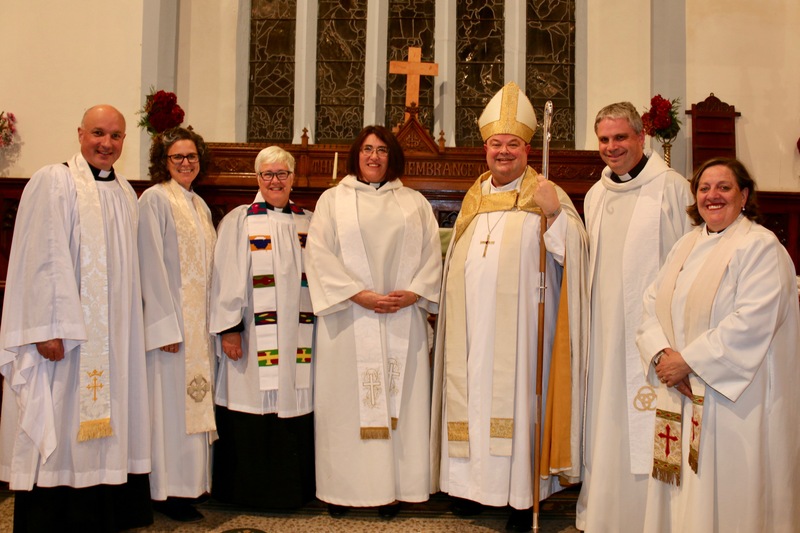 Pictured after the Service were (l-r) Archdeacon Adrian Wilkinson, the Reverend Sarah Marry (Bishop’s Chaplain), the Reverend Katharine Poulton (Preacher), the Very Reverend Susan Green, the Bishop, the Reverend David Bowles (Deacon at the Service), and the Reverend Elaine Murray (Bishop’s Chaplain). This entry was posted in Appointments, Cathedral, Church of Ireland, Church Services, Clergy, Cloyne, Diocese, East Cork, Installations. Bookmark the permalink.